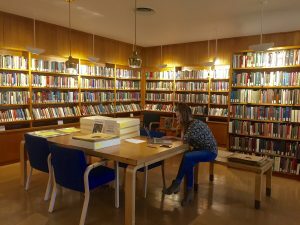 This July, HOLLIS for Archival Discovery went live, and with it a range of our recently cataloged collections became available in an agile and user-friendly search format: among them, the Frederick C. Packard, Jr., sound recordings (described in this article); the Paul Kahn Collection of Bezoar Materials; the Stephen B. Fassett correspondence (featuring letters to and from Ted Hughes, Dido Merwin, W. S. Merwin, and John Lincoln Sweeney); the Woodberry Poetry Room collection of visual materials (including mid-century photographs of the Alvar Aalto-designed Poetry Room); and much more. 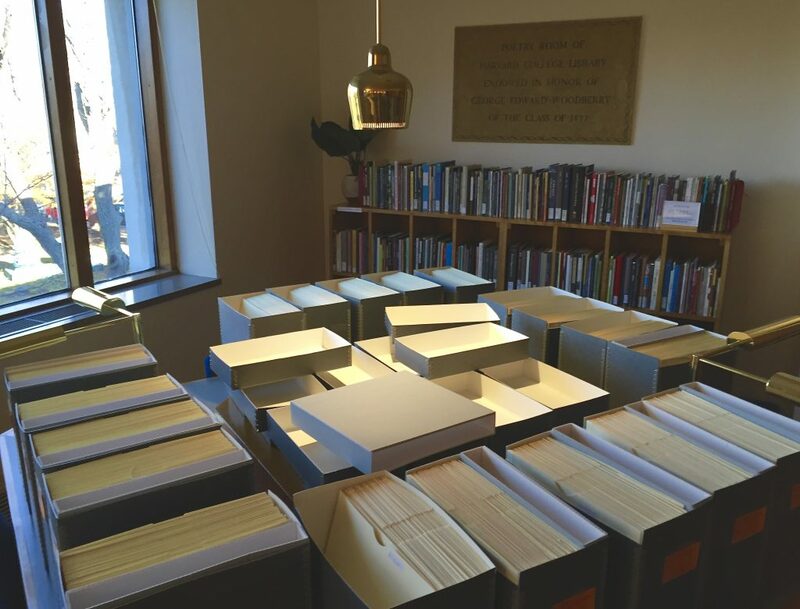 In this post, I will focus on the Packard Collection, which was consummately arranged, catalogued, and described by Mary Walker Graham, and is now open for your research and exploration. 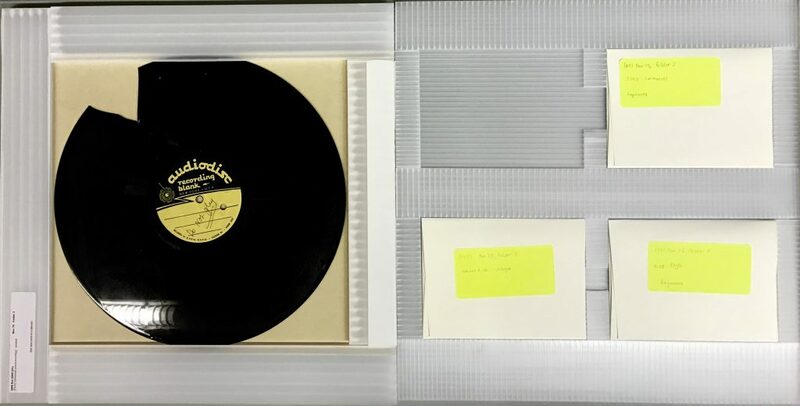 We’ve been waiting until Archival Discovery launched to provide you with a sneak preview of some of the outtakes we discovered during the process: The digital audio material featured in this post will ultimately be attached to the Archival Discovery database, but for now, this blog post will have to suffice. 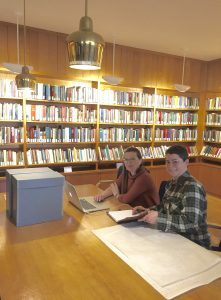 (For newcomers to the Poetry Room, you can also access hundreds of our archival and contemporary recordings via our Listening Booth). In 1933, his early efforts led to the publication (by Harvard University Phonograph Records) of the first discs in what came to be called the Harvard Vocarium, one of the first poetry/literature recordings labels in the world. 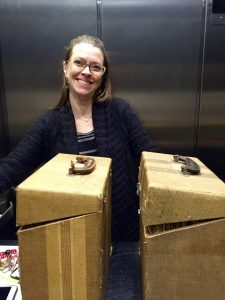 Through Harvard University Press, these were sold to individuals and libraries across the country and around the world—creating a kind of analog athenaeum to educate and encourage listeners from a broad spectrum of the public. Mary Graham and Josephine Packard. 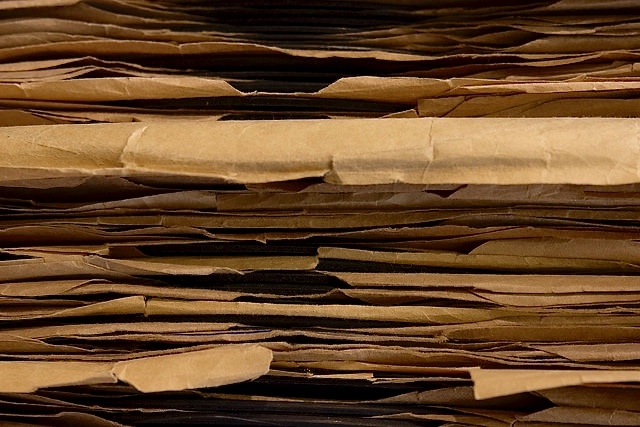 From the mid-1930s, until the university discontinued its affiliation in 1955, the Harvard Vocarium made and, in many cases commercially released, the first (or earliest extant) recordings by Elizabeth Bishop, T. S. Eliot, Randall Jarrell, Robinson Jeffers, Weldon Kees, Robert Lowell, Archibald MacLeish, Marianne Moore, Vladimir Nabokov, Anais Nin, Ezra Pound, Muriel Rukeyser, May Sarton, Robert Penn Warren, and Tennessee Williams. In addition to his commercial venture, Packard actively recorded, commissioned, collected, and created “a repository of all the voices he could get a hold of, a kind of audio time capsule for posterity,” according to Vocarium discographer Josephine Packard. These recordings ranged from surgeries to Shakespeare, Haitian-Creole ritual performances to Japanese-language lessons, experimental radio plays to Scottish border-ballads. The breadth of languages he recorded in is equally remarkable—among them, Afrikaans, Catalan, Haitian Creole, Chinese, Danish, French, German, Russian, Sanskrit, Spanish, and Yiddish. On these separate unpublished discs, you can hear Eliot reading the (consciously) hypnotic opening line with distinctly different pacing and emphasis. Moore can also be heard testing out the delivery of her now famous three-word title, “What Are Years,” a reading which reminds me of (previous Poetry Room curator) Don Share’s wry reference to the erroneous persistence of a question mark in subsequent printings of Moore’s poem. (Share titles his own poem, emphatically, “What Are Years [period]”). Moore was not alone in being both intimidated and intrigued by this new auditory technology: her mysterious peer Weldon Kees (who vanished 6 years after this recording took place) comes about as close to cursing as the Packard G-rating would let him. 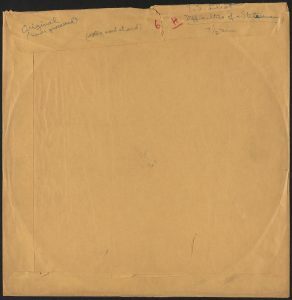 Digital Sleeves: Because we are as yet unable to digitize all of the recordings in the collection (funders please give us a call on our Poetry Preservation Hotline…) and were therefore unable to play the discs to confirm their contents, Mary Graham relied heavily on the liner notes on the original sleeves. She also prepped the sleeves to be digitized. Due to her instrumental efforts, high-resolution scans of Packard’s sleeves are available via HOLLIS for Archival Discovery. Before shot: Packard sleeves prior to rehousing, 2008. After shot: Packard Collection rehoused by Mary Walker Graham. Mary Graham pondering the Packard Collection. Detective Work: Whereas our previous Finding Aids only allowed you to do keyword searching in a vertical-scrolling text document, with the database-style HOLLIS for Archival Discovery you can combine multiple searches, refining them by such fields as author, title, genre, language, year, format (distinguishing between lacquer on metal and lacquer on glass), recording label, and the list goes on. 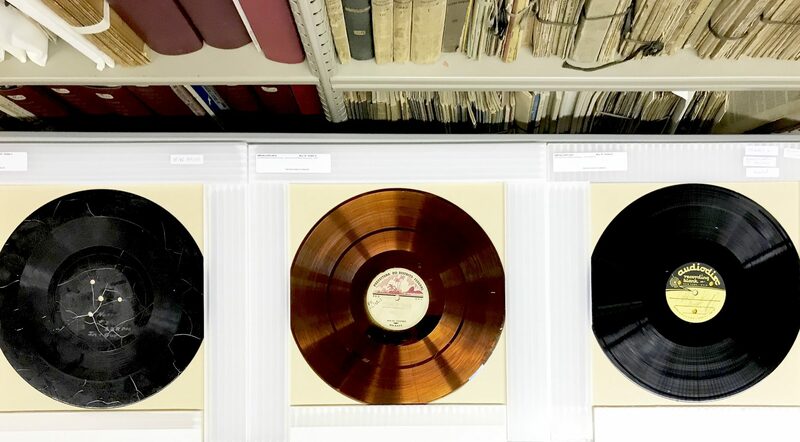 Rehousing Sound: One of the great challenges of the Packard Collection project was (and remains) the at-risk nature of the format, and the special needs these large (sometimes 16″) discs require— especially ones that are delaminated and/or broken. Throughout the process, Graham worked with a dedicated and innovative team of preservation specialists based at Weissman Preservation Center to design and construct custom housing for these fragile materials. Fragments of the lacquer are “shored against” their ruin, by being kept in close proximity to the originals, so that future phono-textual historians and preservation specialists will have the material readily available should the technology become possible to re-piece the scattered analog data. Custom housing for broken and delaminated discs. Broken disc of a Paul Engle recording, with lacquer fragments stored in secure envelopes. Packard would have been immensely moved to have witnessed Graham and our Houghton/Weissman colleagues devoting themselves to this project with the same passion, ingenuity, diligence, and gusto that he himself bestowed upon the Vocarium. I, for one, congratulate them! 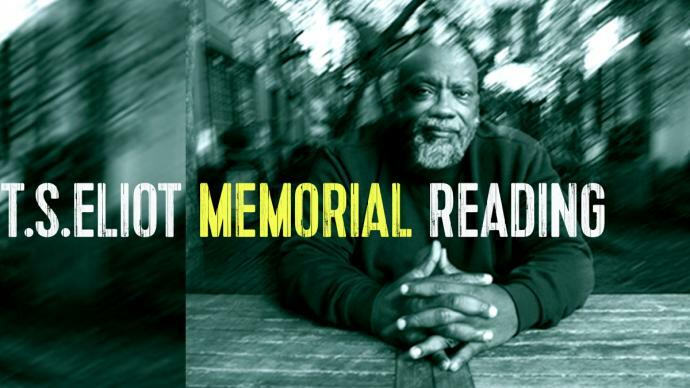 Tagged with: "frederick c. packard", "houghton library", "josey packard", "marianne moore", "mary walker graham", "randall jarrell", "t. s. eliot", "vocarium", "weissman preservation center", "weldon kees"